What are some Important factors to grow your Restaurant? Food is one of the elementary compulsion of life. Without food, one cannot sustain. Whatsoever, the state of mind of the person, one has to eat food. Owing to this high demand, there are so many restaurants in the market. Restaurants belonging to wide range of economic conditions do exist in the market with modifications in the cuisines and themes. It is noteworthy to say that it is really challenging for the restaurant owners to stay strong in this economical world. Following are some essential things which one has to know for running restaurant business effectively. Chef is the main person who decides the fortune of the restaurant. Customer satisfaction mainly depends on the chef efficacy. Chef should be master enough in knowing the public pulse in making the best of the best food, which is the main asset of the restaurant. Even though, the outlook of the restaurant and its maintenance seems good, it is actually the taste of the food, which is pulling the customers towards the restaurant. Coming to the theme and location of the restaurant, it is important to have unique themes that people get attracted and love it. To this, parking place provision adds an advantage. POS, which stands for point of sales, makes the transactions at restaurant easy. Cloud-based POS is cost effective and easier when compared to other software. With the help of POS, the cost of the business can be count down to a greater extent. POS software follows the GST norms for generating the bill. It will also take into attention the inventory, discounts, offers and manages employees. It is multi-platform friendly and is compatible in desktops, tablets, mobile phones. Social media plays a vital role in showing the business to huge number of audiences. Now-a-days, social media is one which most of the people use. So, highlighting the restaurant business on social media serves very useful in raising the business. Mouth publicity is one of the best ways of publicity. Some of the marketing strategies include inviting food bloggers to taste the food, send personalized messages, upload events and pics on social media, notify the customers about the customers regarding the timings, menu changes, offers, discounts and all such. A permanent brand image and invite more customers is possible with an attractive logo. The restaurant logo should be made so unique, creative, and should reflect the ambience of the restaurant. Logo should be made trademark and need to be reflected on billboards, street signs, banners, fliers, magazines, websites, newspaper, menu cards. Logo should create the curiosity among the customers. One can hire freelancers or use canva for logo designs. Maximum profits in restaurant business can be seen when there exist a balance between all the provisions bought and the food made from it is used up by the customers timely. It indicates that supply is meeting demand. Managing the supply and demand is one of the important thing to run a business effectively. Less demand more supply, more demand less supply, both are not good. For successful running of the restaurant, it is important to use effective management tool to achieve the inventory. Restaurant is an ever green business, yet there exist enough tough competition. One should follow efficient business strategies like adopting mobile applications for restaurant and such for its success. Mobile app development cost for restaurant, depends on various factors. For building best apps, reach FuGenX Technologies, one of the top mobile app development company in India. 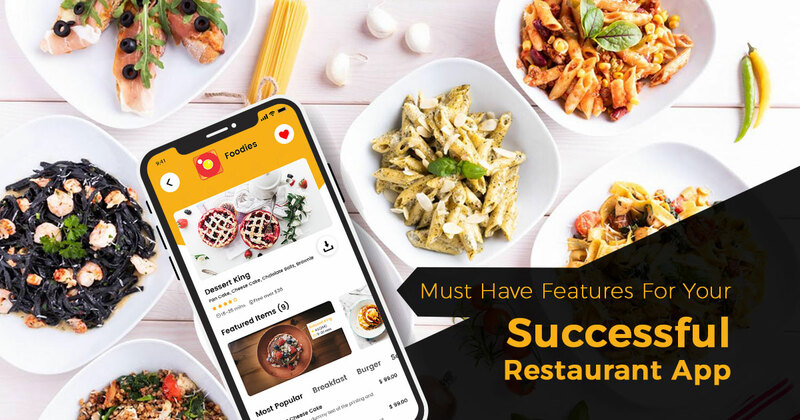 Apart from mobile apps, other important features which account for restaurant success are tasty food, location of restaurant, attracting the customers, etc. FuGenX Technologies is a leading mobile app and game development company in India, delivering quality-driven mobility services across the world, specialized in Mobile Apps, Artificial Intelligence, Machine Learning, Data Science, Automation & Game Designing and Development.